First off, happy Mother’s Day to all of you whether you be a mother to human children, a mother of dragons, a mother to fur kids, or finned or feathered, or a mother to yourself. I hope you are all having a lovely day! For me it has been a spectacular gardening weekend. The big annual plant sale happened on Friday. Bookman and I took the day off. We stood in line to get our entry wristbands then went off to our favorite cafe for a delicious breakfast and lots and lots of coffee. Back at the sale, we only had to wait about ten minutes for our group to be called to go in. We had a wonderful time as usual and got everything on our list except one item that was a crop failure. 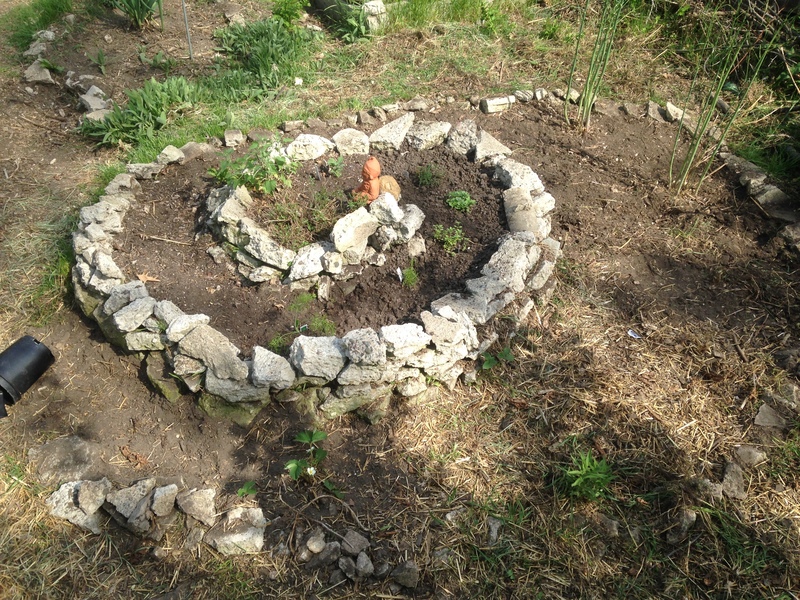 herb spiral was severely neglected last year so we also got lots of herbs to help revitalize it. Sadly, most herbs aren’t hardy here so we have to grow them as annuals and while many can be started from seed, when you only want one, it is easier to buy the plant. So we brought home English thyme, sweet marjoram, sage, oregano, bulbing fennel, and something called olive herb (santolina) that is supposed to have a mild olive flavor. From seed we started our own basil, shiso, cumin and black cumin. There will also be cilantro/corriander and dill that we will direct seed. For the green roof on the chicken coop, until we can figure out what might work up there, I got mostly annuals: cupflowers, dwarf zinnias and creeping zinnias. The perennials we are trying out are a creeping sedum called oracle, miniature pinks and creeping phlox. I had wanted to go all out and make a prairie planting in the chicken garden but the soil there is still super compacted (our garage and concrete parking area were there for 50 years) and still mostly sand. For the last two years we have piled wood chips and fall leaves all over it and there is bit of soil beginning to form but not enough that I feel confident going plant crazy. So we got a few things to try out. The chokeberry is going in as well as a Russian sage, an upright sedum called emperor’s wave, and a prairie grass called blue grama. We’ll see how those do this year and then go from there. A few other random plants, wild prairie baby’s breath, golden creeping thyme, white sweet Spanish onion, wild path rush, a daylily called Ralph Henry, pussytoes, an eggplant and creeping Veronica. We made great progress in the garden but still have lots to do. We had to weed the herb spiral and dig out invading grass. 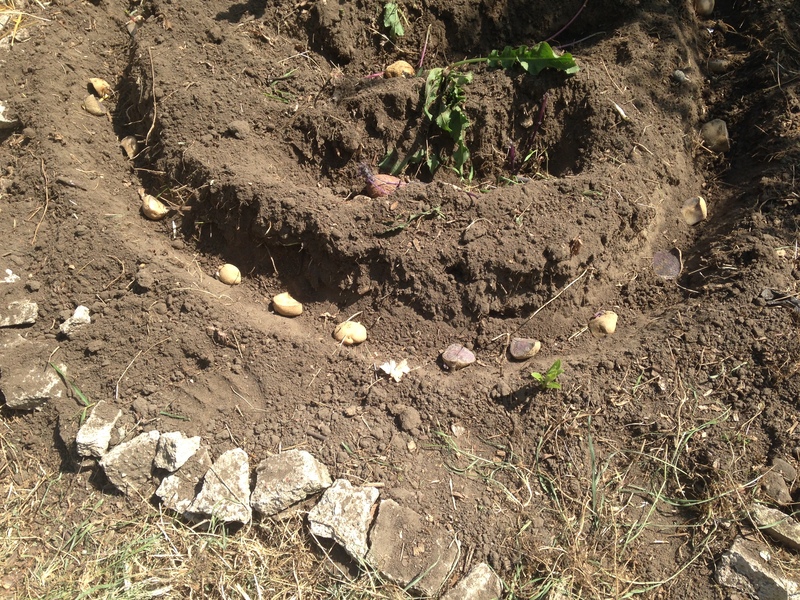 Then we had to dig out invading grass from what was last year’s pumpkin patch so we could make it this year’s potato patch. 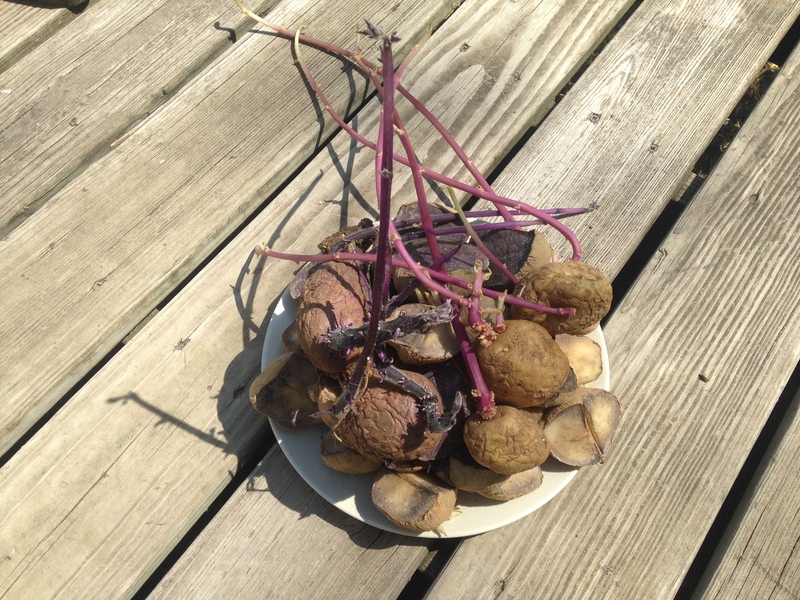 We had saved a few potatoes from last year but also bought new seed potatoes. 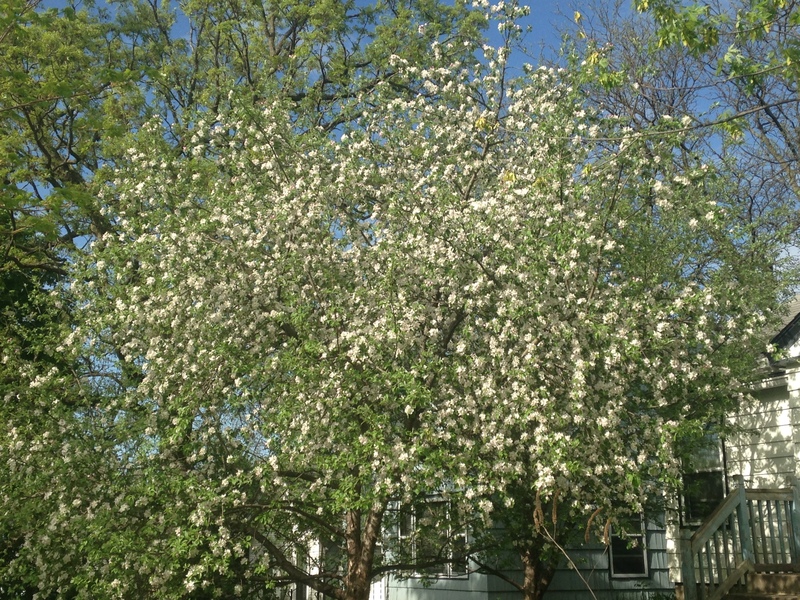 The varieties we get are Irish cobbler and blue Adirondack. The potatoes we saved last year I put in the cool basement in a dark corner on a shelf. This was not enough to keep them dormant and they sprouted big and look like creepy aliens. I am not sure if they will be able to grow and produce potatoes this year. We planted them along with the new batch we bought and we will see how it goes. I will have to do some reading up on how to save potatoes for growing so we don’t end up with alien creatures again next year. Pro gardening tip: wear sunglasses or other protective eyewear when gardening, especially weeding, and keep your mouth closed. This will save you a lot of pain and agony and spitting and crying when, inevitably, you are tugging out a stubborn weed and the root suddenly lets go and clods of dirt come flying into your face. Not that this has ever happened to me, but, you know, it could so I am ever vigilant. getting a semi-experimental planting in it. You know the three sisters planting right? Corn, climbing beans up the corn stalks and pumpkin. Well, the corn growing is so much of a hassle to keep squirrels and other critters from getting at it, that we decided to substitute sunflowers for the corn. So we planted four different varieties of sunflowers. We covered the bed with row cover fabric so the squirrels can’t dig up the seeds. In a week or two, once the sunflowers have gotten on their way, in will go the pole beans and the pumpkins. And unlike corn, sunflowers are not big feeders, they actually draw up nutrients from deeper down in the soil and make them available to other plants. So between the sunflowers and the beans, the pumpkins should have a great year. In theory. The Dashwoods have been banned from the food garden until, well, pretty much until the end of the summer. They are not pleased. They press themselves against the lattice gate trying to squeeze through the openings but to no avail. They try to sneak through right behind us as we go between gardens. They stand there at the gate doing their best to look sad and pathetic. Margaret, clever girl, figured out a way to get around some temporary fencing Bookman had put up along another span of garden and each time Bookman built up the blockade, she figured out a way to get around it. It was pretty funny, though Bookman didn’t think so as he chased Margaret around the garden for the umpteenth time. This morning Bookman put up a more permanent fix much to Margaret’s disappointment. They have their own garden to dig in and they happily spent the weekend doing just that when they weren’t trying to get into the bigger garden. They also got a purple cabbage. And, as were were digging out invading grasses we found lots of June bugs that we would toss to the Dashwoods and they would eagerly gulp down. Still a gazillion things to do like plant the tomatoes and peppers that have been growing in pots in the house since early March not to mention all the direct seed veg like beans and zucchini. I think I could take two weeks off from work and still not be done with all that needs doing. But I think after these last three days with my allergies raging and my tired hands and shoulders, my body will be glad for a little break. I still managed to do some cycling this weekend too. 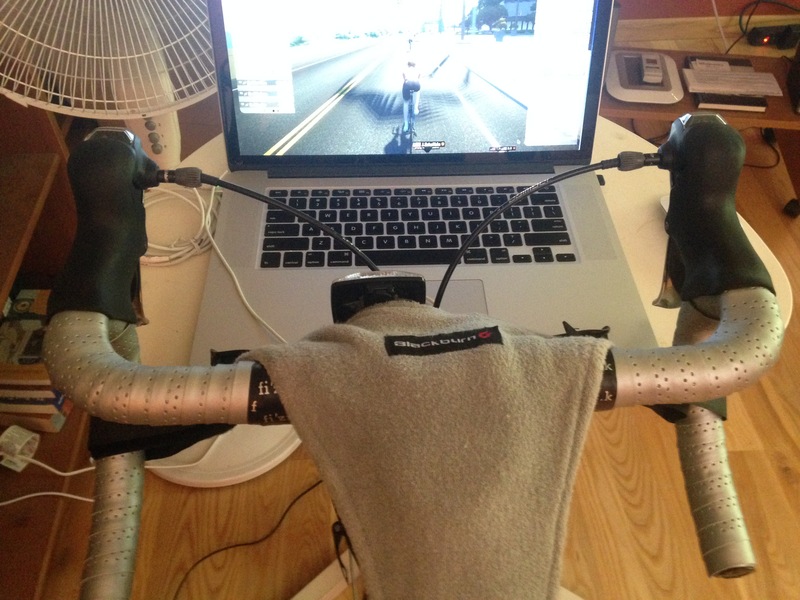 I didn’t go out for a ride but did some hard work on the trainer. And, I took a picture of the silver handlebar tape I wrapped myself. I really like it. Astrid is a dark grey and teal blue with white highlights so the silver goes well. We are scheduled for a bike mechanics class on May 27th so I can learn how to do my own tune-ups. Astrid is in need of one so it is like a two-for, she gets a tune-up and I learn how to do it. Except with all the miles we have done I think she might need more than a basic tune-up. I guess I will find out in two weeks! I think you were like a kid in a toy shop! But so very cool….growing your own cumin and all! !Poor Margaret, for all her cleverness, her fun got curtailed! cirtnecce, oh indeed! You should have seen the original shopping list before it got narrowed down. I always have to remind myself that I have a budget and I don’t have endless amounts of time to spend in the garden. We started the cumin from seed and have never done that before so we will see how it goes! Margaret’s disappointment at being thwarted was both funny and sad. Wow, that’s a super busy weekend! It all looks great and the harvest will yield a lot this year, it seems. And great pro tip! Face full of dirt is not fun. I also learned that handmoisturizer beforehand helps with reducing the dirt that’s stuck in the skin cracks afterward. Goodness! I had to take a nap after reading about your weekend! I wish I could have seen your funny chickens. That Margaret’s one to watch out for! Joan, I could use a nap too! The amount of coffee Bookman and I drank this weekend – nap in a cup as we call it – was a lot. Margaret is the mild mannered bottom of the pecking order chicken so her cleverness and repeated naughtiness were quite the surprise. She is very vocal and let us know she was not pleased when Bookman finally fixed it so she couldn’t get in the garden. Sounds like a great time at the plant sale. Ours was a couple of weeks ago and unfortunately the one plant we really wanted to find was already sold out. We got a few more cacti and some other little plants. Iliana, oh that’s a bummer you didn’t get the plant you really wanted. Hopefully next year. And at least you got some other things so that’s something. Your guidance on sunglasses and gloves gave me a chuckle of recognition. It always surprises just how much garden ends up in my hair! And how long it takes me to get my hands clean properly if I don’t wear gloves. Like you, I plan like I have endless time in the garden but the dreaming is definitely part of the fun. This year’s success so far: I’m managed to sprout some eggplant seeds in my kitchen. We’ll see how far they go towards actually producing something. Maggie, Ha! Yes, when I don’t wear a hat I end up with garden in my hair too! Dreaming is all part of the fun. Excellent work on the eggplant! I tried to sprout some and didn’t have success so I had to buy a plant at the sale. I hope your little seedlings grow big and strong! I’ve grown santolina for years but have never heard it called the olive plant, it certainly doesn’t smell of olives. I have the same problem with raspberries, they’re a real menace, coming up everywhere. I quite often have to shake earth out of my hair after weeding though! That plant sale sounds like so much fun! I’m so envious of your new plants. I got a couple of new ones in the ground last weekend (lantana, sedum, and some geraniums), but I didn’t get to spend as much time in the garden as I wanted. AMB, it is lots of fun and they have grown so big over the years the amount of things on offer is amazing. I never get to spend as much time in the garden as I want! Sounds like your garden is coming along nicely! Isn’t it fun–the anticipation of planting again and all the produce you hope to end up with. I can see how this yearly cycle would be welcome and something to look forward to! I love those spiral gardens–they remind me of mazes. 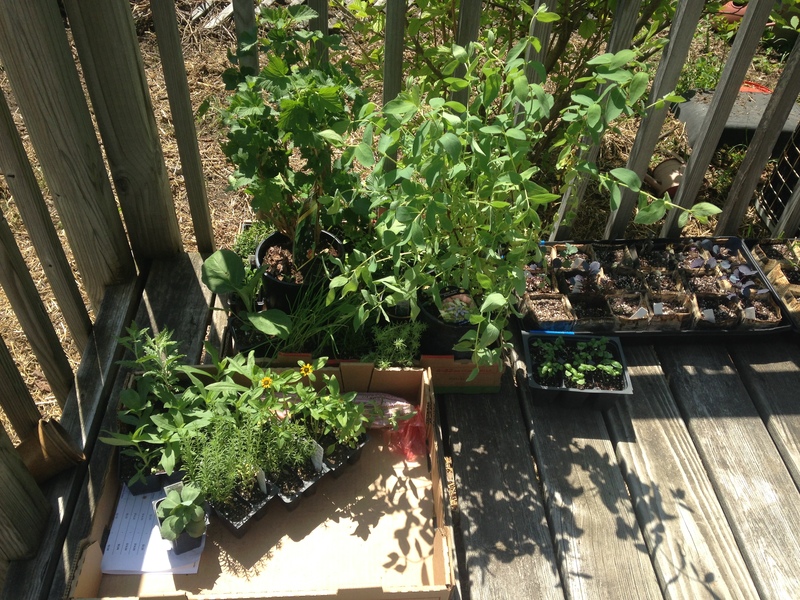 Do you ever grow herbs inside where the temperature is more hospitable?